José Salazar started his musical education in Aguascalientes Mexico at the Center for Musical Studies Manuel M. Ponce. He then continued at Arizona State University studying under Regents Professor Caio Pagano where he received his Bachelors in Piano Performance. Throughout his Undergraduate and Graduate studies he has performed internationally in the US and Mexico constantly. In his career he has participated in many concerts and festivals, which lead to collaboration and master classes with world-renowned musicians such as Vadym Kholodenko and Leslie Howard. He continues to perform chamber music and as a soloist and is involved with local organizations such as the Phoenix Chamber Music Society. He is a very active music educator and has been a part of our school since 2007. As a member of many local and national associations, Mr. Salazar has been an adjudicator for the Yavapai Symphony Guild and the Arizona Study Program. 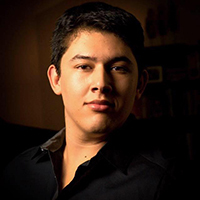 As of early 2018, he is currently finishing his Masters Piano Performance at Arizona State University with Steinway Artist Robert Hamilton and works for the Preparatory Program as well as Teaching Assistant at ASU.